One of the best performances in the bass department under £100, but midrange and treble are not quite as fine. IMP Audio specialises in cables and supports, offering an attractively priced range in which this is a middling model. 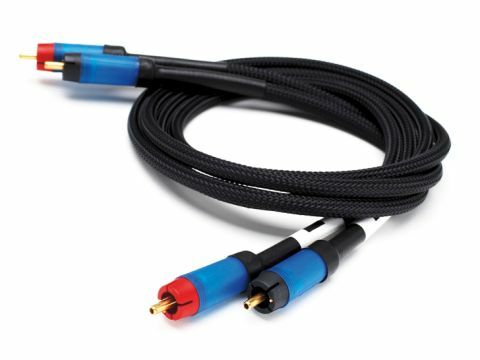 It’s of interest, not least because it is one of the cheapest cables on the market to use the controversial Eichmann ‘Bullet Plug’ phono connectors. After over two decades of arguing, audiophiles seem no closer to agreeing on the relative importance of cable and plugs, but our feeling is that plugs certainly play a part. Where most phono plugs have solid metal centre and screen contact parts, the Eichmanns have a plastic body with only a thin, gold-plated, metal rod which contacts the screen part of the socket. This is claimed to avoid problems with randomly circulating currents in conventional connectors, though on the debit side it may in principle leave the connector more open to interference. At any rate the assembly guarantees a tight fit which doesn’t seem to loosen over time. The wire itself is copper, double screened, and is remarkably flexible. We had good results in some areas with this cable, though it seemed a little fussy regarding application, working better with some sources than others. Perhaps not by coincidence, it was happiest with a couple of moderately upmarket CD players, where its notably fine bass was used to best effect. Treble is a little less assured, seeming just a touch closed in and tight, while midrange is clear but lacking the last word in stereo image depth. As often happens, that combination suits some music better than others; we thought in this case jazz was a good match.